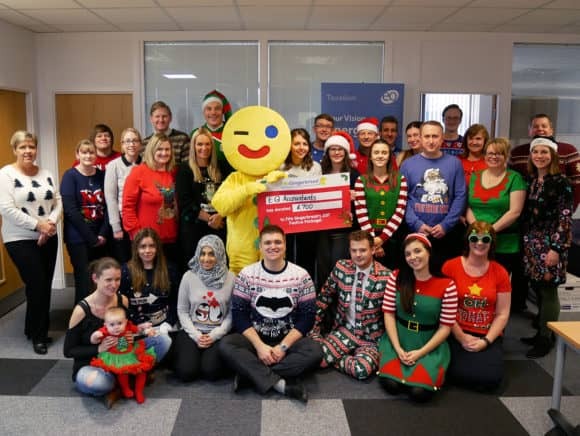 Fife accountants have raised £700 for a local family charity by donning their festive attire on Christmas Jumper Day. Staff from EQ Accountants’ Glenrothes office exchanged their more traditional workwear for Christmas jumpers, Santa hats and other festive clothing in return for making donations to Fife Gingerbread. The team also held a bake sale and sweepstake. Fife Gingerbread supports lone parent, vulnerable and disadvantaged families across Fife. The charity offers many support services to parents and families through various projects, working at the pace and timescale that is right for the parent to overcome barriers such as poverty, isolation and poor mental health. This is delivered through a range of activities all of which are aimed at early intervention, prevention and the engagement of vulnerable families.